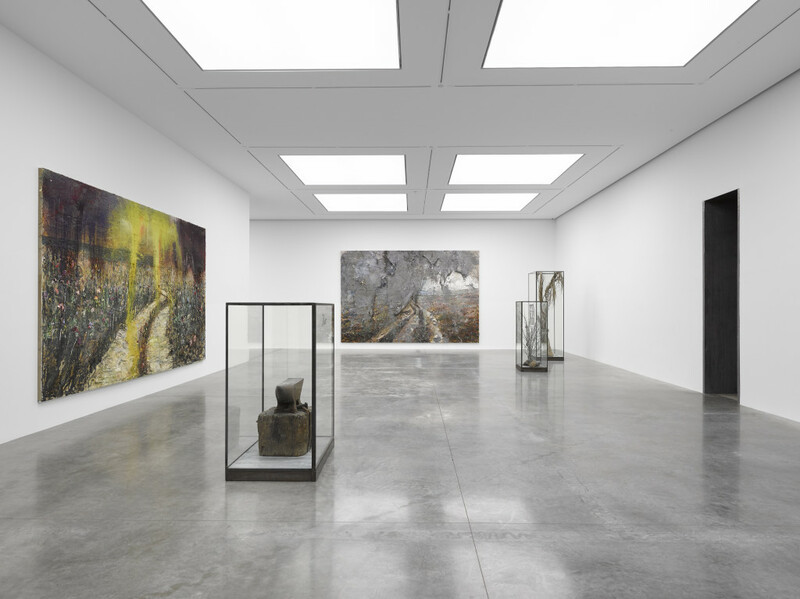 Anselm Kiefer’s most recent exhibition at White Cube Bermondsey in London is at once an allegory and oxymoron between fantasy and raw reality. Entitled Walhalla, after the imaginary Arcadian place in Norse mythology, the show spans the gallery’s entire space, encompassing a newly commissioned site-specific installation, as well as recent sculpture and painting. Featuring the body of work by the same name at its epicenter, Walhalla (1992–2016), the show expands towards numerous side rooms, occupying the long corridor, carrying the same narrative. Engaging multiple intertwining elements from the domains of myth and reality, Kiefer’s exhibition focuses on the people who were sacrificed for their country. In mythology, those perished in battle are taken to Walhalla by the Valkyries, whereas in history, Walhalla references the homonymous 1842 hall of fame and memorial built by King Ludwig I of Bavaria, honoring the heroes and distinguished German personalities of the past two thousand years. The viewer’s first encounter with Kiefer’s new body of work gradually unfolds as an intense and striking experience. 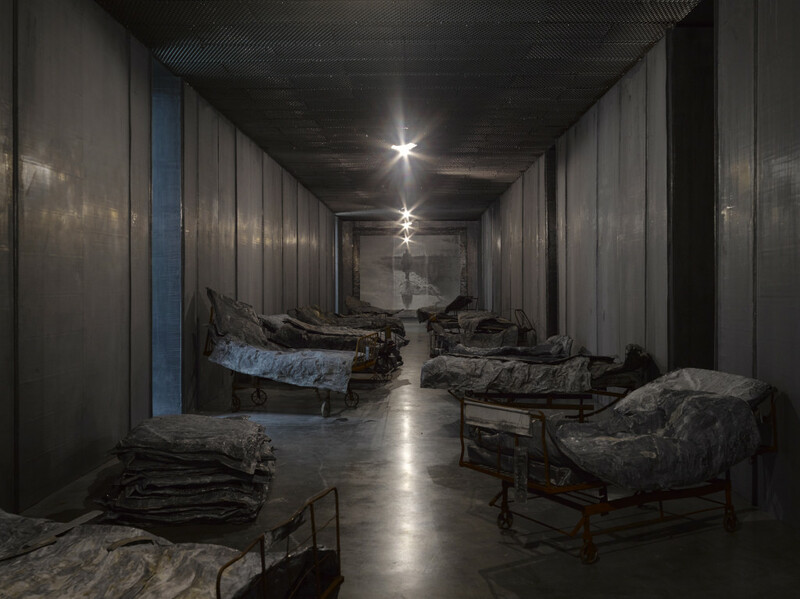 Walls lined with oxidized lead, and two rows of diagonally placed rusty iron hospital beds—similar to the ones created a few decades ago for Women of the Revolution, Les Femmes de la Révolution (1992/2013)—with lead blankets, sheets, and pillows, transform this corridor into an ambiguous war setting, initiating an unsettling atmosphere. While some appear vacant and others occupied—name tags can be seen hanging from their frames—the beds suggest either human presence or absence, respectively. The realism of the scene is embraced by a black and white photograph at the far end wall mounted on lead, which depicts a blurry male figure walking towards an undefined, deserted landscape. 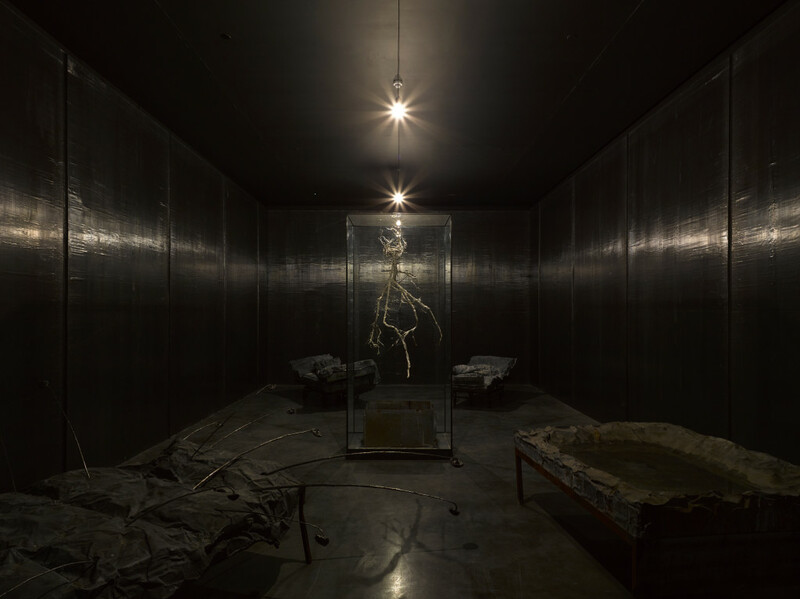 An analogous eeriness is sustained at Philemon in stasis (2016), installed in a claustrophobic side room of the galleries, featuring the same hospital beds—one of the beds seems to have sprouted with stems of metallic flowers, whereas opposite, there is a cistern half-filled with unclean water. These elements are all arranged around a tall glass vitrine containing a dead tree’s carcase, its root system suspended upside down over a square vessel. In Arsenal (1983–2016), the installation in the adjacent room, the setting is evocative of some secret underground chamber that would appear to contain classified information. The dimly lit room is filled with a conglomeration of a large volume of overflowing archival material untidily packed, comprised of all sorts of documents—stacks of battered cardboard boxes, decaying paper in flat files, black and white photographic films, and negatives, strung up and suspended throughout the space. The third room plays host to San Loreto (2016), a dark space with a single bed supporting a big rock, which appears to be suppressing a creature (perhaps a fallen angel), with only its large black wings are visible. This figure is a recurrent theme in Kiefer’s iconography; a winged being also emerges in paintings (2009–10) bearing the same title. The title references the home site of Jesus, Mary, and Joseph in the Italian town of San Loreto, which according to a Catholic legend was converted into a church by the Twelve Apostles—in the thirteenth century, mysteriously purported by angels from Nazareth to be saved from Turkish hands, soon becoming an eminent pilgrimage spot. In all four spaces, Kiefer similarily conveys notions of isolation, abandonment, and fragility as the result of intense and fierce human intervention. The installations in the exhibition emerge as time capsules confining a bygone era, left behind like fossilized echoes of human history and memory. At once ingeniously attached to episodes of mythology and legend, Walhalla generates a surreal dimension over the course of each narrative. Opposite the central corridor, viewers are confronted by a colossal spiral staircase—entitled Sursum corda (2016), referencing the Ecclesiastical Latin term for “lift up your hearts,” a call for thankfulness and openness to God—the installation disappears into the ceiling. Populated with worn out and tattered white dresses and robes, suspended from the handrails alongside strips of film reels mounted onto lead, the piece evokes the moment when the Valkyries—the female selectors of the slain—bring their chosen ones to Walhalla. During this transition, their bodies evaporate, gradually losing their corporeality to enter the spirit realm, freed from the materialism of the world they have left behind. Intersecting the spirituality of the Catholic Church with that of ancient myth, Kiefer pronounces not only the significance of this passage of the soul, but also the underlying human need for redemption, restoration of honor, and the continuation of memory. The two larger galleries feature Kiefer’s signature mural-sized paintings, paired with an assortment of other works encased in glass boxes. Utilizing an extensive range of media—acrylic, oil, photographic emulsion, glass, clay, copper, shellac, and lead—the artist also employs other not so widely used materials such as bleached clothes, earth, stones, trees, dried plants and leaves, as well as metallic items like hospital beds and bicycles. The canvas paintings are monumental—the Walhalla (2016) series, alongside nubes pluant ustem (2016), Gehäutete Landschaft (2016) and Böse Blumen (2016), resemble post-apocalyptic and lifeless landscapes. Depicting tower structures as the main protagonists, standing inactive and redundant like skeletons of the past. This motif was created for Kiefer’s set of Am Anfang (In the Beginning) (2009), a series of performances presented at Opéra Bastille in Paris—the forms derived from the twelve brutalist and National Socialist architecture-style towers constructed with the concrete casts of shipping containers. While Kiefer did not directly experience the two World Wars, his work attempts to absorb recent memories of the events that irrevocably altered the course of mankind, embedded within the history of post-war Germany. His interest in German mythology, combined with the influence of his teachers Joseph Beuys and Peter Dreher in the 1970s, the writings of Jewish poet Paul Celan, and the musical work of Richard Wagner, shaped Kiefer’s visual language from its early stages. Wagner’s impact on Kiefer’s artistic utterance is particularly present in this exhibition, his development of the concept of the Valkyries— Die Walküre (The Valkyrie), taken from the second of the four pieces that form Wagner’s Der Ring des Nibelungen (the operatic drama otherwise known as the Ring Cycle)—based on the same Norse mythology from which this exhibition embarks. 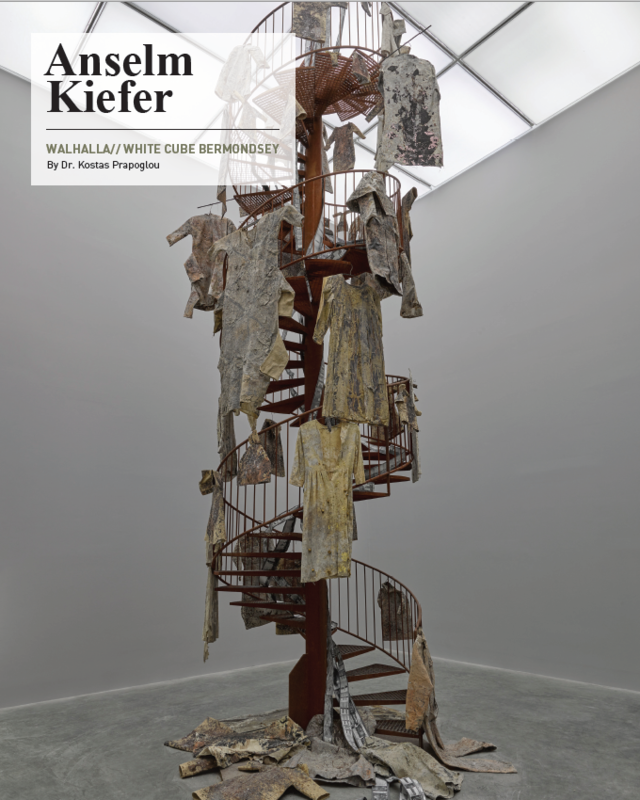 However, Wagner’s known association with the Nazis and German nationalism is also a point of reference for Kiefer, especially when considering the weight of history that seemingly appears to confront the disastrous past and the anxiety of the present. Walhalla recalls these memories, the traumatic scenes that undoubtedly haunt the artist and his generation. 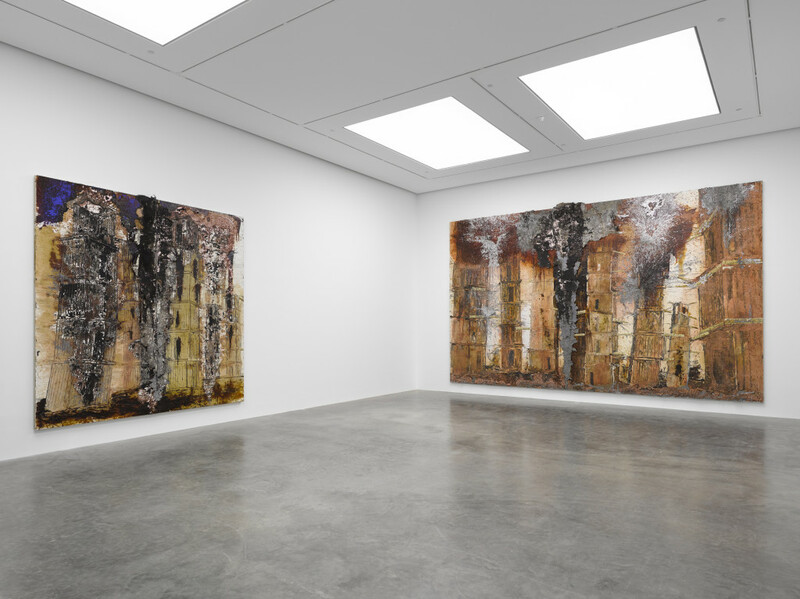 Anselm Kiefer, Walhalla at White Cube Bermondsey in London ran through February 12, 2017. May 23, 2017 | Filed under Art Seen: International, PAST ISSUES and tagged with Anselm Kiefer, Kostas Prapoglou, London, The Seen, White Cube Bermondsey.